Anns Swimming School - This page will explain all about our teaching methods, the ages that we teach, how the classes divide up into different groups, mostly by ability, how each level works, what you can expect (from the very young and the older kids) and how sibling's can be in the same class﻿! This page will explain all about our teaching methods, the ages that we teach, how the classes divide up into different groups, mostly by ability, how each level works, what you can expect (from the very young and the older kids) and how sibling's can be in the same class﻿! This is a photo I found (and love!) 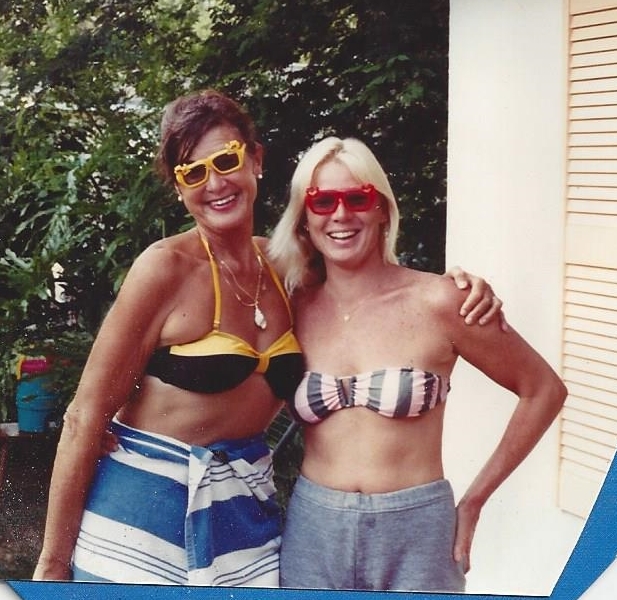 of my Mom and me (Ann & Susie Truby) from many years ago! We've been teaching together (& still are!) for well over 40 years! Ann's Swimming School offers group classes in our outdoor heated pool for kids 22 months old to kids up to 10 years old! We have classes for kids who cannot swim at all or who can swim some,but don't know how to roll over and float or come up for a breath of air and also for kids who do swim, but now need to learn or work on all the different swim strokes & technique! And because sibling's may attend the same class, it's much easier for you parents! So, please read on to find out all about it! If your baby is under 21 months please check our Parent & baby classes page. We do not offer private lessons here or at your homes. To find our schedule and our prices, please click on the 'Our Session's & class schedule,What exactly a session is, How to register & Our Prices' page. On this page you will learn all about us,our teaching methods,how we divide the kids up into different groups (based on ability and by age, for the most part) in the same class. So, young non-swimmers to the kids learning strokes, technique are able to come to the same class and much more! How and why siblings are able to be in the same class (and that makes it easier for you as well!) where you wait during their class, we'll explain what to expect from it all and why the very young do usually cry on the 1st few days,but! after reading about that, we think you'll feel much more comfortable and not so nervous! Getting your children safe and able to save themselves if they fall into a body of water is the most important thing! Especially living in a state where water is everywhere! I cannot begin to tell you just how horrible it's been over the years﻿ to have heard stories and to have personally met parents, who have lost children to drowning! Everyone should know how to swim! Even parents and the people who take care of your children! So, please take a few minutes to read our web site. I explain why the kids do cry the first few days and how and why I know that they will be okay,even if they do cry! And they do become safe happy kids who love swimming! That's something very important to us! We don't only want them safe, we want them to love to swim! We look forward to meeting new families and seeing of all of our families who have come back year after year! Many of our students have come back and are working or have worked for us when they were too old for swimming lessons anymore! We're on 2nd generation of families as well! Many parents took classes when they were little and are now bringing their kids to learn how to swim where they took classes! How fun for us!! It's a great feeling! Teaching children to be water safe and to love swimming, has been and still is the most rewarding feeling and something that I think you will come to find, after having your kids here, that it is our number one priority, our love and our passion! The brothers in this photo both cried when they first started and they both started classes under 2 years old, but as you can see, I think the photo speaks for itself! And they continued to come back summer after summer, eventually learning their strokes and because their mom couldn't keep them away because they loved their classes so much! 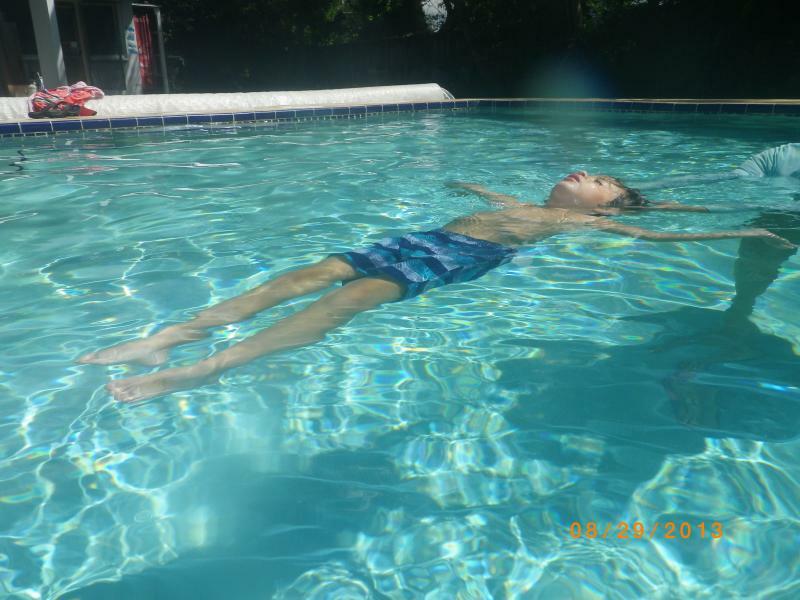 Ann's Swimming School has been teaching children to swim in Miami for over 40 years! And it is a family business run by the Truby family. Ann had 6 children and all of her kids and thier spouses and her grandchildren, have at one time (or still do) worked at the school! Her daughter Susie has been with her from the start and has owned the school for over 20 years. Ann still teaches a few classes, but retired from the business running part of it! We have never advertised! It's all been by word of mouth! Something we are very proud of! We are now teaching 2nd generation children! And quite a few of our employees took classes as children and have come back to work for us! It's such a wonderful thing,teaching the kids of the now adults,we taught when they were young and having some of our alumni come back and work for us! We teach children of all ages to swim in our group classes. We do not have private classes. Starting with children 6 to 8 months old up to 21 months in our Parent & Baby class. Our group classes,done here at our home,in our heated (when needed) outdoor pool,are for children 22 months to 10+ years old. They come to our 10 day sessions (you can find out more about what a session means,the dates of them and class times on our sessions and class schedule page) and because we divide the class in to different groups, not just by age, any and all ages can attend at any time of day, any session that we have availability in. This means that siblings may attend the same class together. The children are divided into different groups in the pool, but each child is worked on their individual needs, every day. Even if the older kids know how to swim, they may not know all the different strokes and techniques. So this is why families come back year after year to continue to learn. We are now teaching second generation families! It's wonderful to see the parent's who we taught as children,coming here so that we may now teach their children to swim! Many of our very own staff learned how to swim here. They loved it so much that they came back to work when they were old enough! Siblings are able to swim in the same class because the kids are in groups divided according to ability, not age! So, please read on to find out all about how we do this. During the months of March-August we offer 2 week/10 day (Mon-Fri,of both weeks) 40 minute long group swimming lessons in our heated pool in South Miami for children 22 months of age and older (if your child is under 22 months, please go to the Parent & Baby class page). You are not in the pool or the pool area. Please read more about parental viewing below and you can see our whole set up on our Photos of the school and classes page! Then from late August thru mid-December (your child must have taken and completed a full 2 week session 1st) the school offers a maintenance program (in our very warm heated pool!) where you may come 1 to 4 days a week or month. Please see our Maintenance/refresher class page for more information. During the peak months there are usually 10-12 children in each class,with 3 to 5 instructors and/or assistants in the pool depending on ages and levels of the kids. Please read on to find out how we divide up the children in their class. Parents are not in the pool area during the lessons, but the pool is visible from the parents' waiting area. Check out our Photo page to see how it looks! You will be waiting in our very large cheekee hut with chairs and ceiling fans and it is very shaded! We also have cold drinks for sale. You will be invited in on each Friday to view the class. The 1st Friday you will be invited in to view 15 minutes after the class has started and on the last Friday you will be invited in about 5 minutes after the class has begun. On both Fridays you will be leaving 5 minutes before we take the children out of the pool (so that we can keep track of them!) and we'll bring them out to you as usual. And,don't forget your cameras! ﻿﻿ On the viewing days, you may bring other family and friends. But,please try to limit extra cars! Every day that you are here! Our parking spots are limited. To see photos of where you wait,the view of the pool from there and much more, take a look at the photos of the school page! No matter if you have a fearless child who jumps in the minute they see water or one who is very afraid of water they need to learn to swim and to be pool safe! The class usually breaks up into 3 or 4 different groups or "levels", but because each child is different, they are worked on their individual needs. The very young non-swimmers and children who may swim some, but can not come up and get a breath of air yet, are usually seated on the steps. Many times, the 1st few days a child (especially one who is nervous because it's a new situation, no matter what age) may start in one group, but then advance to another group, but no matter what group they are in they are worked on exactly what their needs are! ﻿ For example, you could have a group of 2 year olds, but one of them needs to learn how to put their face in the water, where as the other one already does so, but needs to improve their kick. This applies to a child of any age, so every child is worked on exactly what they need and they advance more every day. If your child is older, say 7 years or so,and a non swimmer, we're not going to put them with the children in swim diapers because they would feel uncomfortable. Because each child is worked on their individual needs, we are able to have all different ages in the pool at the same time. Every time your child comes to class, they are worked on what they need to learn to help make them good safe swimmers! The ratio between teacher and child vary with age and ability. With the very little children, the ratio is usually 2 to 1. There may be 4 or 5 in each little group. If this is the case, then there will be 2 teachers/assistants.The older kids or kids that can swim, the ratio may be 3 or 4 to 1. The number of children in a class may vary, but no matter if the class is small or full, the ratio will always be the ratio that is needed. Many families ask and wonder, how is it possible to get the very young to sit and listen, but, they do! For some reason, when you are not right there, they do listen to us. It may take a class or two, but kids love routine and they follow by example. Once they like and trust us, it is very easy. Families have been amazed at how we are able to do this! We love and believe in what we do and it shows! With the little ones,crying on the first few days,some very loudly,and not being very happy at all to be here with us,is very likely to happen, a very normal thing and something we are very used to! Because they are young and most things to do with any type of water, be it in the bathtub or the pool, has been done with you,family. So please do not worry if they cry. Even if they are happy in your pools,yet cry here, it's only because we are strangers at first and we need a few days for them to see that we are okay and get to know us! Some cry because naturally they want you and others cry because they aren't used to having to sit and wait their turn and want to just jump in! Because they are used to just jumping in your pool or getting in and out when they want to. The things that you do or say on these 1st days are very helpful and much appreciated. Please just be positive and try not to make a big deal about the crying. Take their minds off of it and talk about something else. Also, please don't say things to them before or after the class, like "oh you're okay now, you're back with mommy or daddy now". This makes us look like the bad guys! Also, please do not tells us in front of them things like "they are afraid of the water",etc. It doesn't help them! The calmer you look, the calmer they will be. There's no way around the unhappiness sometimes these first few days. Just remember that what you are doing is vital in South Florida. Also with the little ones, please do not feed them or give them bottles at least one hour or more before class. When they are upset, crying or nervous they tend to throw it all up! Some before they even get wet! You will be amazed after a few days to see them happy and excited to come to swimming class! We've seen it happen for over 30 years! With the very young children,22 months until 2 to 3 years old,what we are trying to achieve,especially the kids that have never had anything to do with water,or in the tub they've never had water on their faces or been underwater at all,is at the very least, to get them happy, comfortable and safe in the water so that if they were to fall in they would not panic. We also teach them how to get themselves safely back to the steps or the side of the pool. We do put them underwater (gently) even on the 1st lesson. If they are really upset about this, then we limit going under the 1st day to 3 times. We do a count of 1,2,3 then put them under the water. Just enough so that their heads are completely under. After the 1st few times, they know and get themselves ready (holding their breath) and they go under easily without drinking any water at all. We also do a lot of turning them over on to their backs, with the hopes of having them floating without help one day. This is important because when they are young, they might not have the strength to pick up their heads and get a breath of air, so being able to roll over on to their backs mean they will be able to get a breath of air. It is also important to teach them how to hold on to the wall and if they can't climb out, how to move themselves to the steps. We also try to teach them how to pull their bodies up and then sit down on the step. Many little ones might be able to hold their breath and go a short distance thru the water, but if they can't get their heads out from under the water, then that little bit of distance does them no good. Each child is different, so each child is worked on what they need. After they learn the above mentioned,we then start teaching them (or improve on, if they already do so) how to kick, use their arms and move through the water. Things to know before you ever even take our classes! Please read the page that tells you about floatation devices and the page that tells you ways to get your kids comfortable in the water before they come here! The more you know how and what to do with your kids before they get here, the faster we can teach them how to be pool safe and help them learn to swim quicker!! The next step is having them swim, come up for air,put their heads back down and continue swimming. Lifting their heads for a breath most often is a very hard step and does sometimes take kids quite awhile to learn! When they are able to swim across the pool by themselves, floating on their own, taking breaths, and getting across without our help, then we start to teach them basic strokes and strokes on their backs as well. We also teach them how to tread water. This is almost like running in place, with their heads above the water. Knowing how to blow bubbles is very important and another thing we work on. Knowing how to blow bubbles will also help kids to learn how to go down to pick up rings on the bottom of the pool Even an adult who does not know how to take a breath and then exhale by blowing bubbles, will become over exerted and tire easily if they don't know how to blow bubbles! ﻿So many people believe that your body just sinks to the bottom of a pool! This is the level where we start to really teach them all the different strokes, front and back, diving (just from the pool deck, we do not have a diving board), endurance, longer distance swimming and more. When they've mastered their strokes, we also teach things like the racing turn and we even may teach some water ballet! So, here at our school there is something for everyone, from the age of 22 months (6 to 21 months,please see parent & baby class page) to children even up to 12 years old! And these are not separate classes for the older ones. They are just in the advanced group or level in the class and this is why all the kids can be in the same class!